After a seventh straight freeze on Saturday morning, southeast Louisiana and southwest Mississippi temperatures will begin to moderate. No additional major cold air outbreaks are seen in the 7-Day forecast. Today and Tonight: This frigid week will conclude with another afternoon of with highs in the upper 40s. 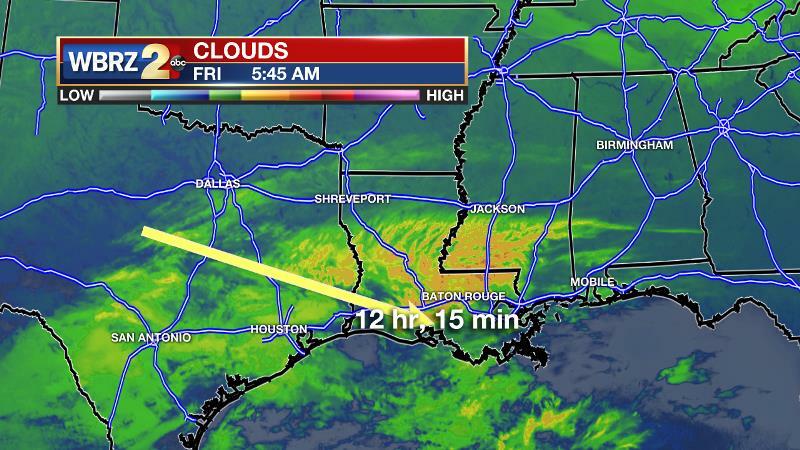 A pocket of clouds stretching from southeast Louisiana to central Texas will move over the area through the first half of the day. Otherwise, some sunshine is expected. Due to clearing skies and light winds overnight, one more freeze is expected into Saturday morning. Up Next: Even with a few high clouds advancing into the region on Saturday, high temperatures should be able to climb into the mid 50s. The milder air may give you an opportunity to remove temporary wrapping from pipes. Thanks to return flow, and therefore climbing dew points, low temperatures will stop above freezing Sunday morning. The WBRZ Weather Team is currently projecting a low of 41 degrees, which would be the first morning above 32 degrees in 7 days! Highs may make it into the low 60s on a fairly gloomy day with abundant cloud cover due to a storm system arriving late. The bulk of the rain activity will occur Sunday evening into early Monday morning. Quiet weather and seasonable temperatures are around the corner for next week. No freezing temperatures are expected through next Friday. The Explanation: The deep trough responsible for a week of frigid air in the Eastern U.S. will begin to lift northeast through Saturday. As noted in blogs earlier this week, a pocket of positive vorticity advection is producing a patch of mid-level cloudiness that will pass through the area from west to east through the first half of the day. This afternoon, high temperatures will start to moderate by about 5 degrees each day through Sunday with assistance from a southeasterly shift in winds. One more freeze is expected Saturday morning before at least a week or so of seasonable temperatures. Forecast models are locked in on a shortwave trough that will push across the Southeast with rain and possibly a few thunderstorms as the weekend concludes. Confidence in timing is high with this system and the majority of the activity should occur overnight Sunday into Monday. This wave will likely bring a weak front through the area too, leading to rapid clearing on Monday afternoon. Near normal temperatures are then forecast to stick through next week.